Hey there! Thanks for dropping by Family First Community Garden! Take a look around and grab the RSS feed to stay updated. See you around! We just finished another round of planting, including tomatoes, muscadines, and a choke cherry tree into both the local community garden and the MetroFarms seed garden. Lots of things are happening really fast around this time, so we’ll try to be more diligent with our updates. We planted a few things during April. Pictures available in picasa web album. We’ve completed our first scheduled work day, and it was totally amazing. We had friends and family, food and fun, gardening and glee. This view from the treehouse is amazing. 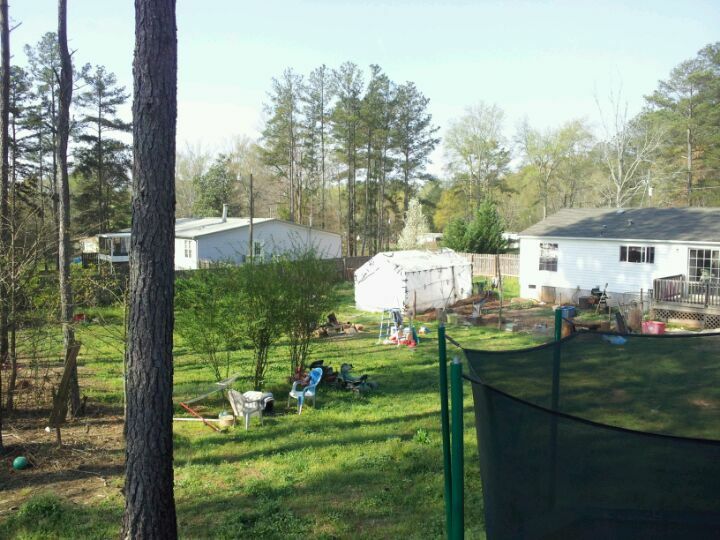 You can really start seeing the transformation of the yard into a garden. We started the day with visiting the various mulching projects we’ve got going. 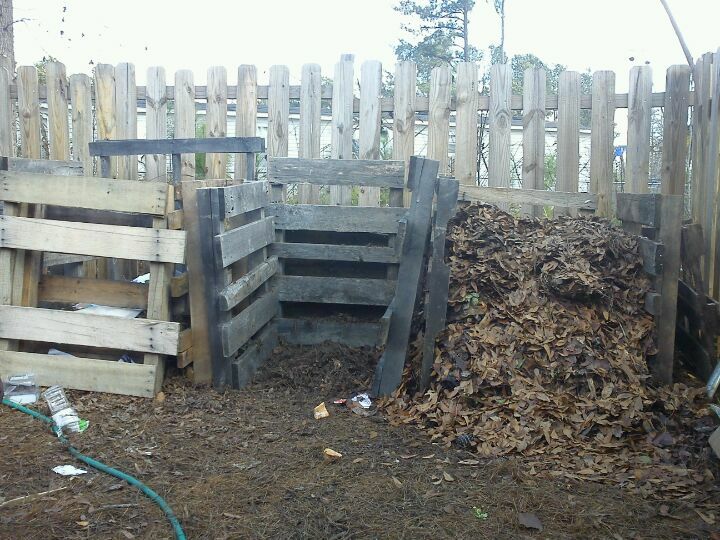 First up is the Family First Composting. We turned all the piles and combined them into 2 complete piles. 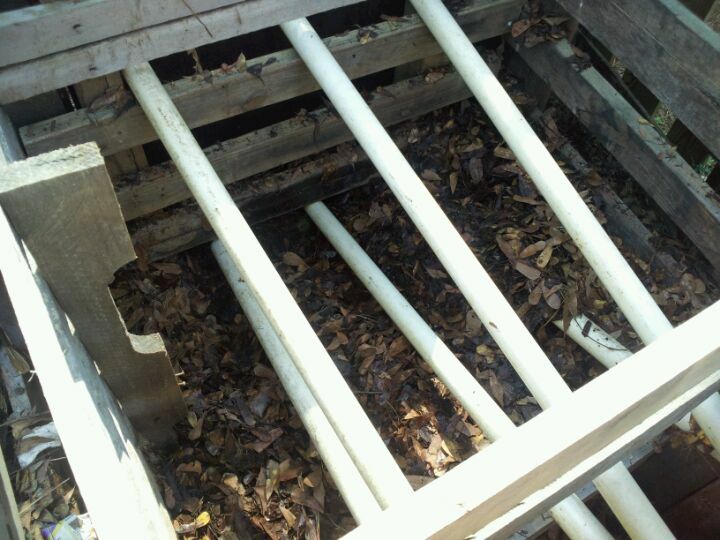 We also added in the vent pipes we got for free thanks to Machelle. This is before we started the workday. 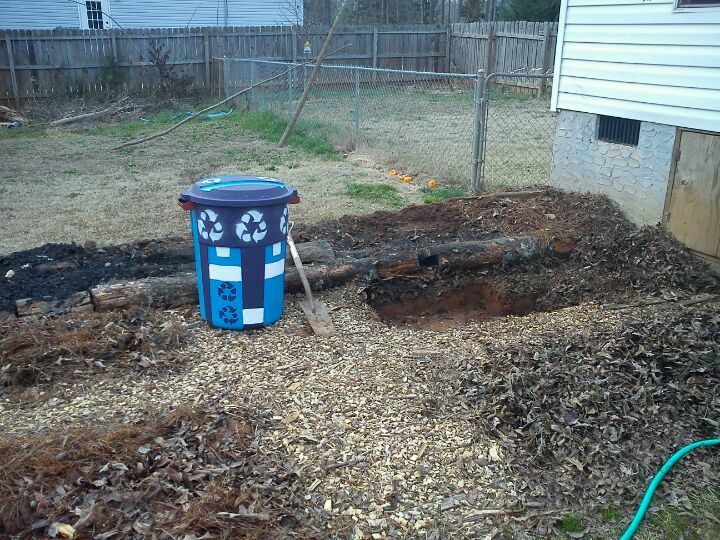 The center pile is the oldest, being several months into cold composting at this point. 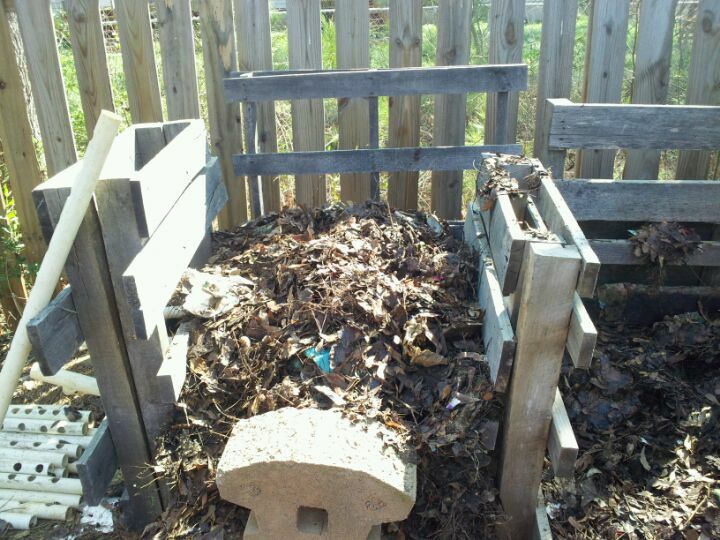 I broke it down and shifted the still decomposing stuff into the pile on the left to continue breaking down, and the rest into the pile of leaves composting on the right. This is the finished pile on the left. And the pile on the right before we filled it in. It is covering the pipes now. We then moved on to finishing up some aesthetic work, and finished a pathway in front of the greenhouse (Concinnae Greenhouse). The path is at the end of the Slopes of Mount Olympus. This is our kitchen garden. 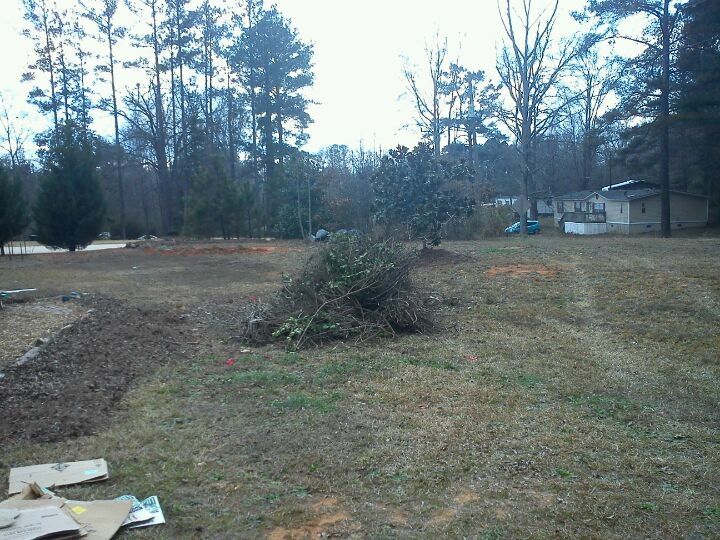 We did no other work on the slopes, but more pictures of what’s already growing there are on the foursquare page. We then hauled some dirt from the Grave of a God. This awesome spot is the grave of a huge tree removed almost a decade ago. The dirt is amazing there. 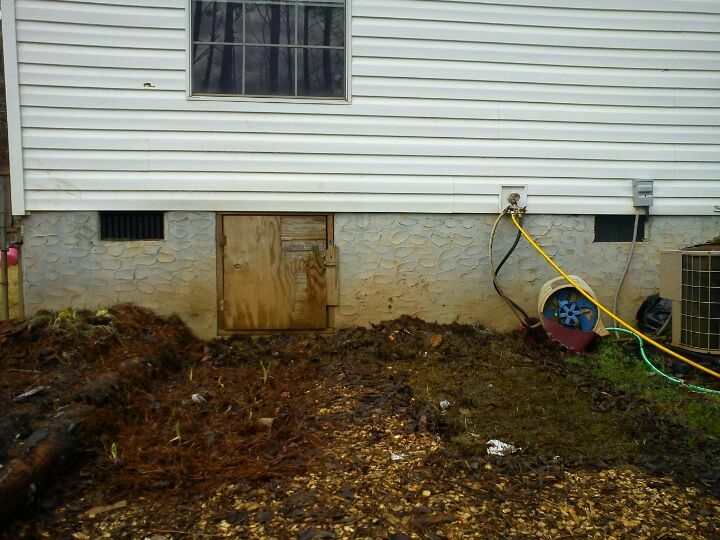 We’ll probably get 15-20 loads of dirt from this spot without altering the landscape significantly. That amounts to ~2 trailer loads of high quality topsoil, free within 100 yds of the garden. Resources are everywhere. The dirt ended up in Loki’s Mischief., our first planting area in the public portion of the garden. 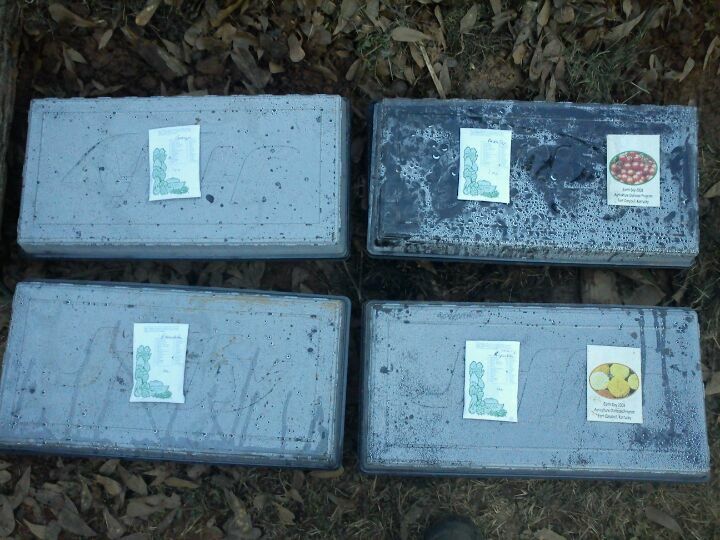 So far we have potatoes and collards planted and growing. We should be producing some serious quantities of seed by the fall, all to be distributed to community gardens through Metro Farms and personally by the Concinnae Family. We also planted some snow peas into the newest bed built. 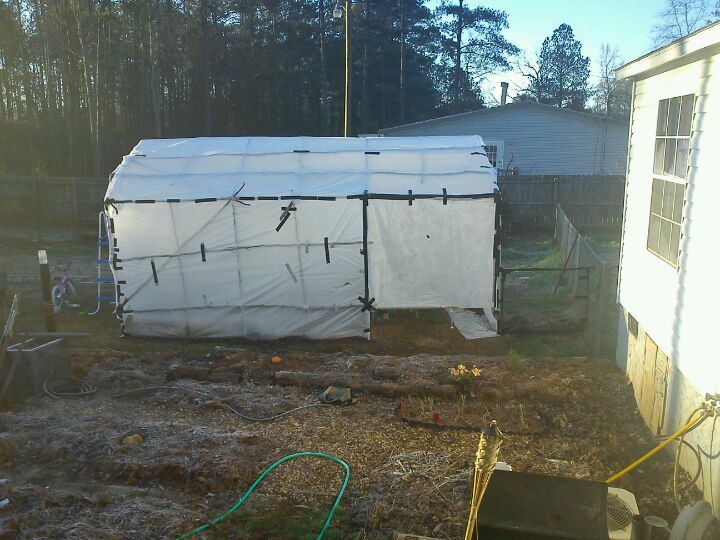 We’ve got our greenhouse finished, finally. 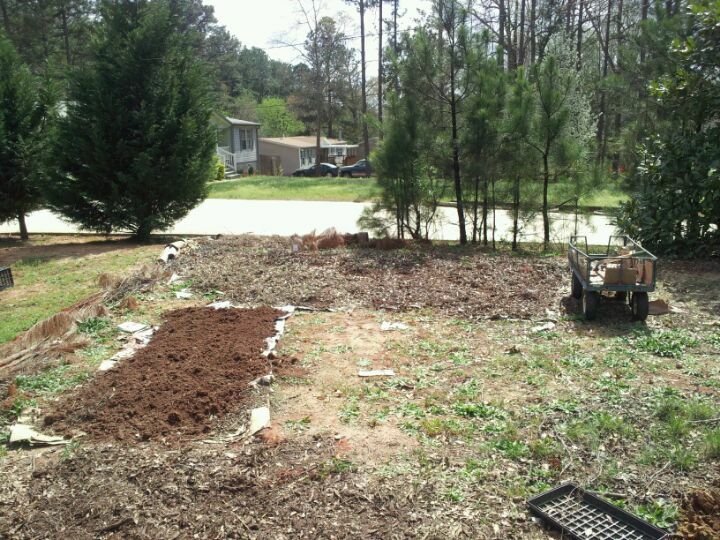 The bed still needs topsoil, but the seed starter kits are already planted. I’m hoping to get a digital planting map up soon. First planting of intentionally grown food!!! So way back in early december I “planted” some garlic out into one of the garden beds. They started peeking through the mulch layer they were growing in and I figured I’d bless them with a better home. I did have that bed already trenched out. 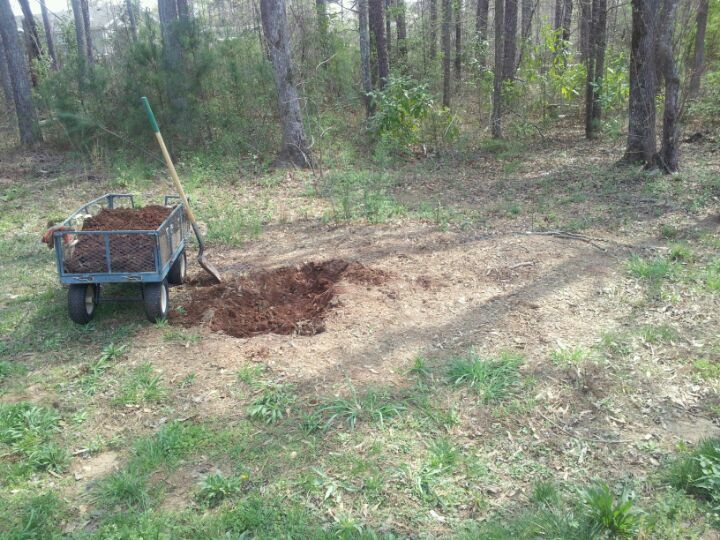 So last night I went ahead and layered in plenty of mulch and dirt and planted out some red potatoes and garlic. Here’s the foursquare check in from this morning when I took some photos. And here we're getting ready to spruce up the new neighborhood for the garlic and potatoes we planted last night. 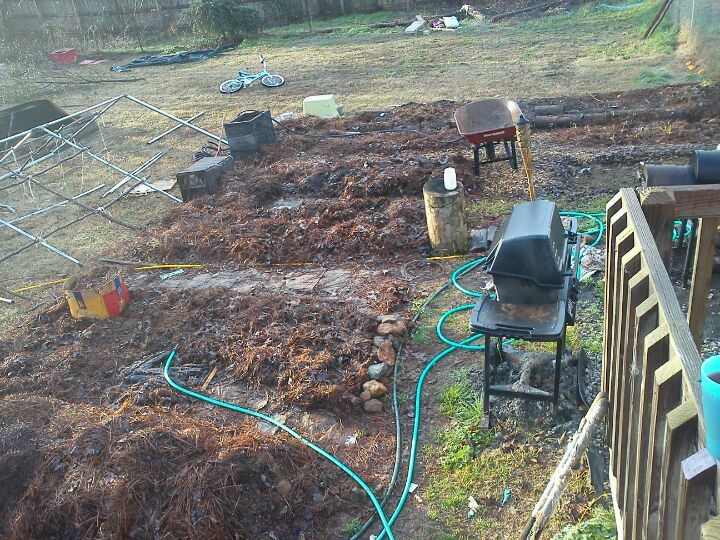 From left to right, hooglekulture for pumpkins, garlic and red potatoes, and a fallow bed. And we've spruced the neighborhood up a bit. We planted in the pumpkins on the hooglekulture to the right (along with a nice plastic flower pulled from the leaf bags). 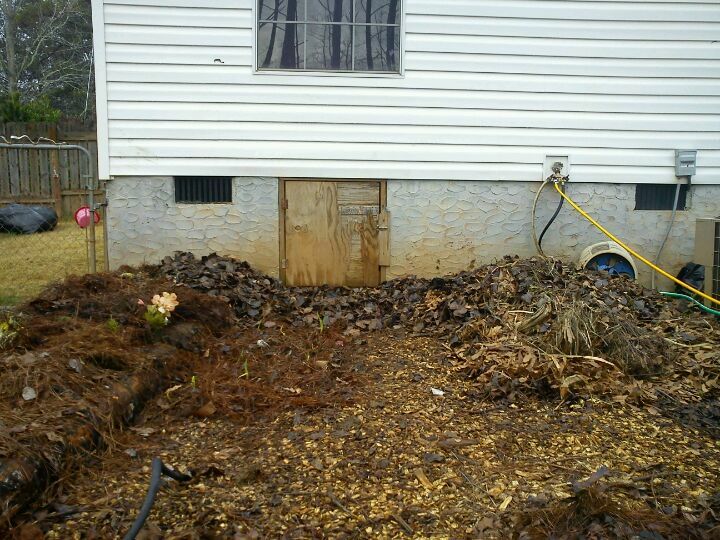 We then piled the donated leaves along the foundation wall and over the fallow bed we'll be adding in the near future. I’d like to welcome you to the future. A future of sustainable human existence. A future where the greatest pursuit is happiness. Welcome to our little garden. We’re the Concinnae Family. We’re an intentional family. Having universally grown up supremely unhappy, we’ve decided that life as we were taught wasn’t worth the effort. We’ve decided to live a other way. One of the goals we have sustainable living, which is easier with homegrown food. So we’re starting a garden. 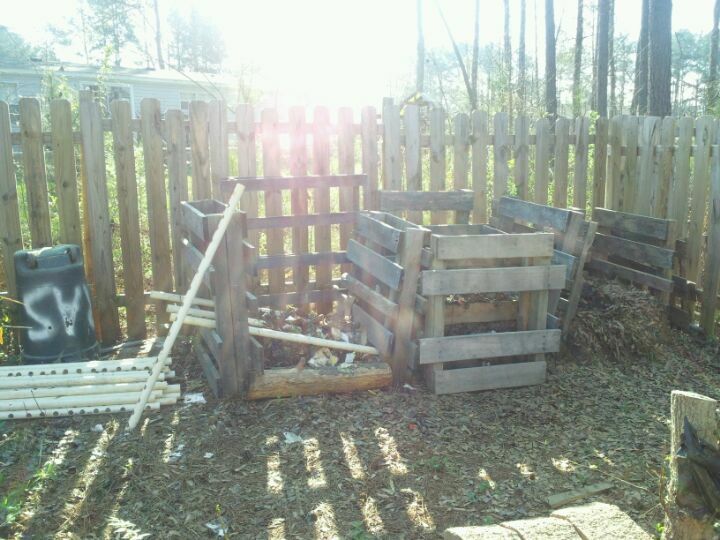 We utilize permaculture principles in most of our projects now, with this being our first. We’ll have several zones, including a kitchen garden, two food forests, and some wild zones. 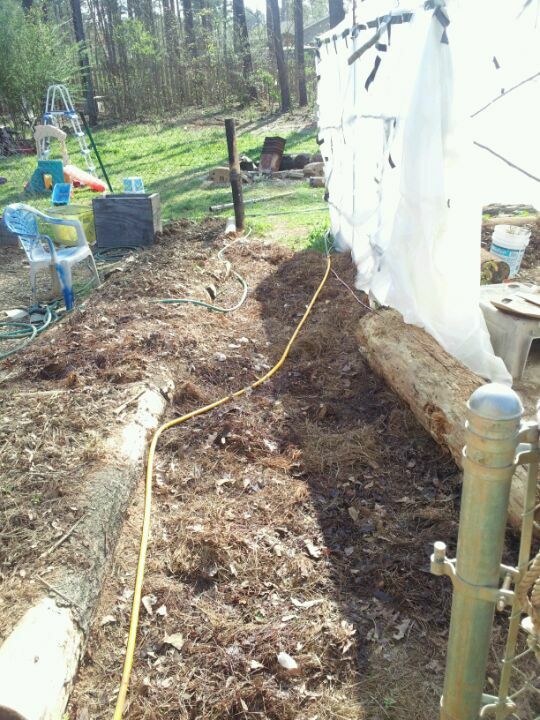 This is the food forest in the front. It’s public property as far as I’m concerned, so drop by and get involved. Pile of debris dropped off by this guy I pulled up behind on his way to the dump. Had a truck load of yard debris and bagged leaves. They’ll go to the hooglekulture for the front forest. These are from the family garden in the back. This is about 1/3 of the leaves from the guy from above. I made three piles that big from the leaves. A BURNation warrior guards the kitchen garden next to a 75% dug out treasure trough. Welcome to the New World! We’re building a new way to live and thrive together as communities.